When an artist writes that their latest album is influenced by Willie Nelson’s “Phases and Stages” and that they wanted to ‘make an old-school record that’s about quiet stories and steel guitars’, my attention’s well and truly caught. Throw in the fact that Grant Langston is based in Bakersfield, California (he’s a bit too raw to fit in with the Nashville scene and sound) and the expectations are running high even before I discover that the album was recorded live in the studio. So, does it live up to those expectations? The album opens with “Drive”, which tells the story of two loners hooking up in a bar and features some lovely plaintive pedal steel. It’s almost the archetypal ‘two lonely people’ song, but the idea of giving the finger to the world adds just a little edge. “The Nonsense” and “Breaking Hearts” are both breakup songs, the first is uptempo and focusses on the social and financial manoeuvring involved in a divorce while the second explores the situation from the viewpoint of the wronged husband descending into alcoholism (another old country theme). “Fading Fast” wouldn’t sound out of place (vocally or instrumentally) on a singer-songwriter album in the early seventies, with a melancholy tale of denial as a relationship disintegrates, emphasised by a lovely, languid slide solo. So far, it’s almost straight-up country, but with a few hints at a harder lyrical edge. “Born to Ride” is an electric piano-driven slice of boogie (Californian rather Southern), and the shimmering beauty of the pedal steel intro to “The Only One” leads us into relatively familiar unrequited love territory; it’s a nice slice of melancholy with some female backing vocals to add to the pathos. “The Trigger” is stripped down to the bare essentials of acoustic guitar and solo vocal as we’re taken inside the mind of an outsider who has committed an atrocity and given reasons why we might all share the blame. It’s a powerful message emphasised by the minimalist setting. “Don’t You Dare” is a series of admissions of guilt from the male partner in a relationship, with a little lyrical twist in the tail; whatever else he did, he always loved her. “All That I Can Do” is pure melancholy; it’s minimalist and desperate and the only way the mood can go from here is up. And it does because the last three songs are all fairly light-hearted affairs. “I Work Too Hard” is an uptempo generation gap song with a nice lyrical twist at the beginning which sends us momentarily in the wrong direction before exploring the relationship between a hard-working father and his slacker son. “Me and the Misses” deals with a relationship which works despite, or perhaps because of, mutual incompatibility. The closing song, “Me and Margaret”, could be the logical progression from the album’s opening song as the two characters meet in a bar before going on to become serious drinking partners; it’s a honky-tonk which is horrific and hilarious at the same time. 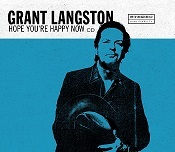 Grant Langston’s laconic delivery and the laid-back arrangements on “Hope You’re Happy Now” focus the attention on the strength of the songs and they’re very strong indeed. His songs are in the country idiom but it’s twenty-first century country and it has the simplicity and realism that characterises the songs of writers who have been able to bridge the pop-country divide, such as Nick Lowe; it deals with the poetry, triumphs and tragedies of everyday life, working on a level we can all relate to. This is a little classic. “Hope You’re Happy Now” is out now on California Roots Union. Grant has made the decision not to stream this album and has given his reasons in an open letter on his website. You really should read it.